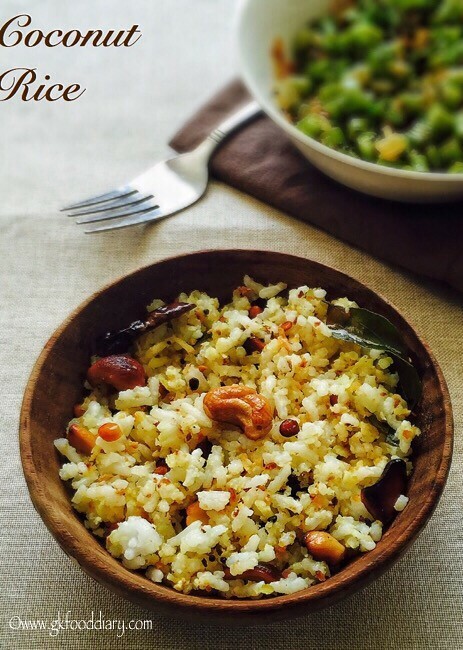 Coconut rice/ Thengai Sadam – a healthy, flavorful and tasty meal made with coconut and little spices, which is apt for lunch box. This is my moms recipe and I have eaten this coconut rice several times a week during my childhood. 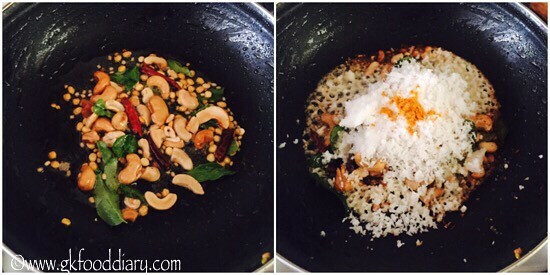 This one of those quick meal that can be made in jiffy if you have grated coconut in hand! 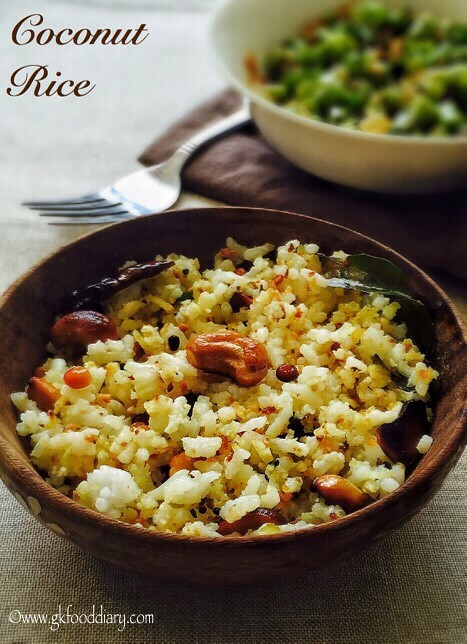 It goes well with papad or any stir fry! This coconut rice can be given to babies after one year or once the baby is started eating with the family! 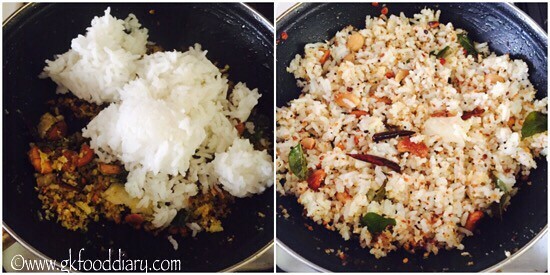 Here is how to make easy coconut rice recipe for toddlers and kids. 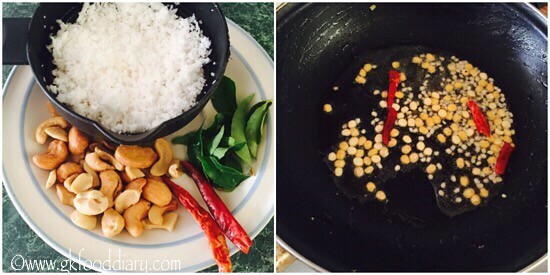 Coconut Rice - A quick tasty meal made with rice, spices and grated coconut. 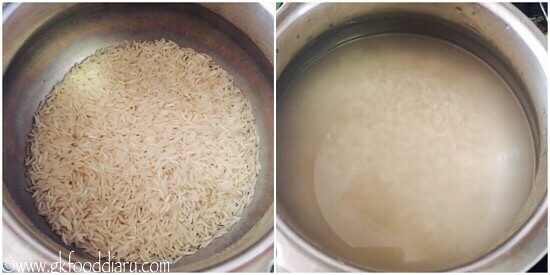 Wash rice thoroughly with water. Pressure cook rice in a medium flame for three to four whistles with required amount of water. Once the pressure releases, open the cooker and fluff the rice with a spoon slowly and set aside. Keep all the ingredients ready. Heat a kadai with oil. Add all the items listed to temper. Let mustard seeds cracks and urad dal and Bengal gram dal turns brown. Then add curry leaves and cashews. Let the cashews turn golden brown. Then add grated coconut along with turmeric powder and required salt. Mix well. Saute the coconut for 3-5minutes in low medium flame or until the nice aroma comes. Now add cooked rice and mix using a fork slowly. Mix well until everything gets mixed well. Switch off the flame once done. Give at least 15 minutes resting time and serve. 1. Wash rice thoroughly with water. Pressure cook rice in a medium flame for three to four whistles with required amount of water. Once the pressure releases, open the cooker and fluff the rice with a spoon slowly and set aside. 1. Keep all the ingredients ready. Heat a kadai with oil. Add all the items listed to temper. Let mustard seeds cracks and urad dal and Bengal gram dal turns brown. 3. Saute the coconut for 3-5minutes in low medium flame or until the nice aroma comes. 4. Now add cooked rice and mix using a fork slowly. Mix well until everything gets mixed well. Switch off the flame once done. Give at least 15 minutes resting time and serve. 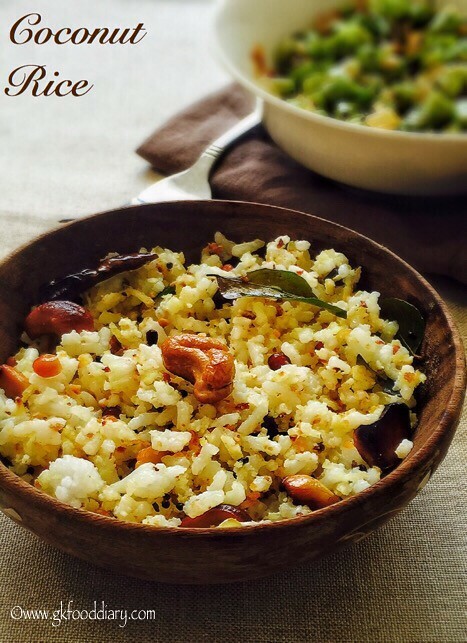 Serve the cocount rice with papad/appalam or any stir fry of your choice! Bliss! Hope you liked this recipe. If you wish to get regular updates, do like my facebook page GKFoodDiary or follow me through Google+,Twitter! 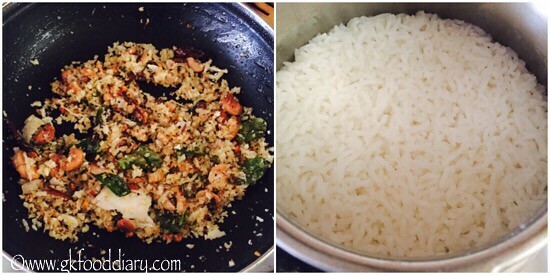 You can even make this coconut rice with left over cooked rice too. 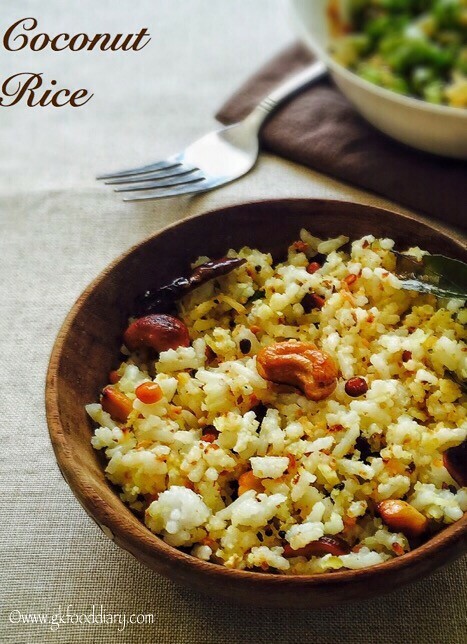 Any normal cooking rice can be used to prepare this rice. You can add powdred nuts instead of whole cashews for small babies. For small babies mash the rice well and offer. 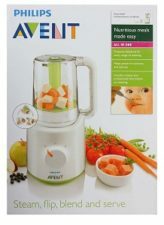 Can Basmati Rice be used in this ?